When you first started your search of apartments for rent in Littleton, there’s a good chance that you came across Summit Riverside Apartments. For those looking for luxury apartments, our amazing amenities are hard to beat! There’s a lot to love about having an outdoor heated saltwater pool, barbecue area, basketball court, playground, fitness center, and more, but for many it was our kitchens that really sealed the deal. That’s to be expected thanks to the fact that they contain stainless steel appliances, designer flooring, and dark wood cabinets. Who wouldn’t fall in love with those things? And it’s with that thought in mind that we came up with the topic for today’s post. 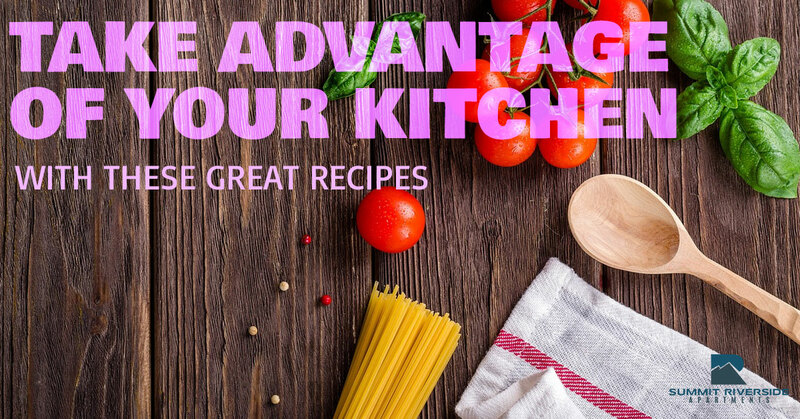 If you’re looking for ways to put your kitchen to good use, we have a few great recipes to share. Keep reading to learn more! The first recipe we’d like to share is for Lemon Baked Cod and it comes from the folks over at Genius Kitchen. Many people out there think that fish is too hard to get right, but this recipe makes it all but impossible to get wrong. A half dozen ingredients is all you need to make the fish, but our recommendation is to serve it with a side of rice. The end result is a delicious meal that will be ready in around half an hour. It doesn’t get much better than that! Who couldn’t use a go-to mac and cheese recipe? If you don’t have one yet, this recipe from Food Network (and courtesy of Ree Drummond) is the one for you. There’s just something about this comfort food that’s hard to beat, but Ree might have one upped herself thanks to her extra instructions for making “Macaroni and Cheese Slider Bars” near the bottom. Whichever direction you take with this mac and cheese recipe, it’s a real winner and it’s the perfect thing for any night of the week. What good would our list of recipes be if we didn’t include a dessert? Fortunately, this is the best of the bunch. With almost five stars and over 7,000 ratings, everyone agrees that this recipe for a clone of a Cinnabon from AllRecipes is just about perfect. We’ll admit that it’s a little bit involved, but the end result is so delicious that it’s hard to care. Plus you get to spend some time in your amazing kitchen, so it’s a win all the way around, right? Are You Searching for Apartments for Rent in Littleton? Don’t live in an apartment with a great kitchen (yet)? We’d love to show you around at Summit Riverside Apartments. Other unit amenities include full-size washers and dryers, plush carpeting, patios and balconies with storage, walk-in closets, wood-burning fireplaces, central heating and air, and track lights with updated fixtures. We strive to make our living spaces the best of the best because we want you to actually be able to enjoy your living space. With a pet-friendly pet policy, nearby bike trails, a contemporary clubhouse, and more, there’s a lot to love about living here. You don’t have to take our word for it though. Schedule a tour today to see it for yourself! We think you’ll be pleased with our neighborhood and find that there is a lot of fun to be had here in Littleton. If you’ve been eager to find a luxury apartment that you’ll enjoy living in, Summit Riverside Apartments might just be the perfect choice for you. Come by today to check it out. We look forward to hearing from you!